The brief for this room was to replace all the furniture and lighting to work with the existing curtains; to lighten the room and unify the overall look. The beautiful handmade painted furniture is from Surrey based furniture company Leporello, with a pretty Colefax and Fowler weave applied to the footboard and headboard to bring out the soft pinks and greens from the curtains. 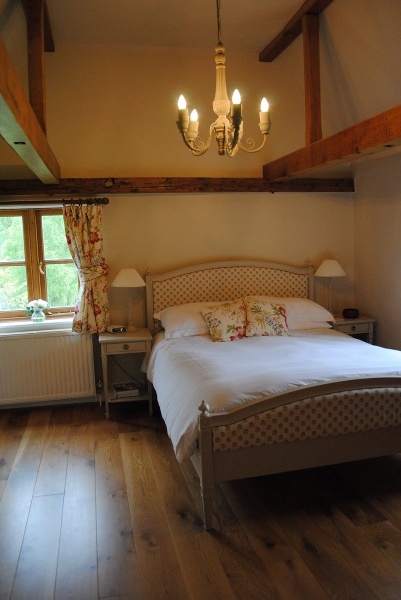 Two small candle lamps were placed on the bedside tables, also from Leporello and a rustic chandelier was hung to compliment the furniture and work well against the Oak beams in the vaulted ceiling.